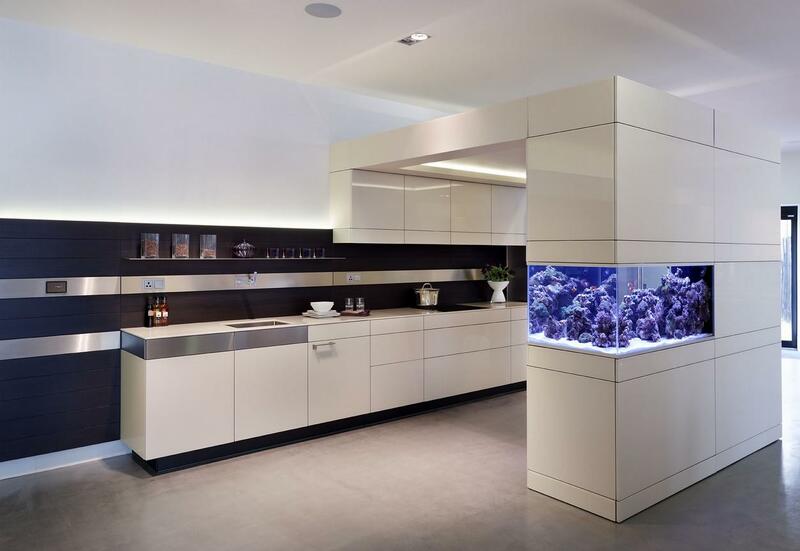 FeastHome – Have you ever thought about placing an aquarium in your kitchen? Actually, the feature of an aquarium in a kitchen will make it looks outstanding, suitable for you who want to make your kitchen as the center of attention in your house. The aquarium will make you getting relaxed and calmed doing your cooking activity. Looking for the aquarium kitchen ideas? Check these out for your inspirations. 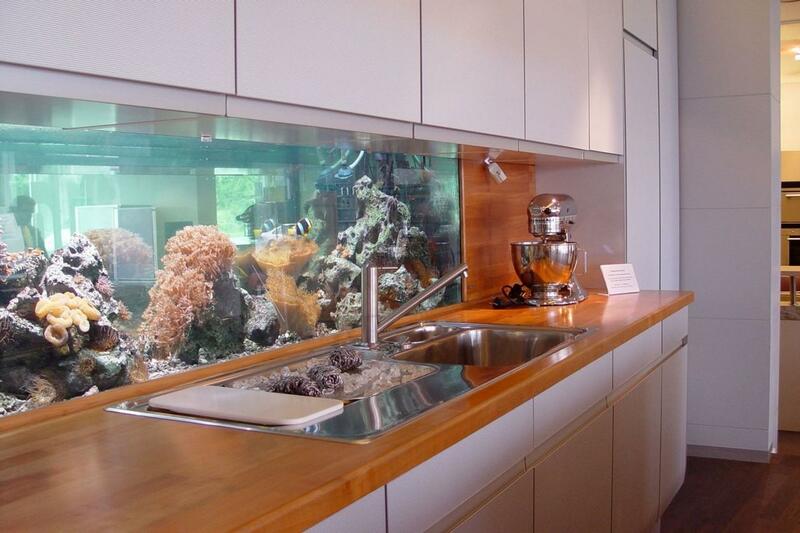 For you who are a nature lover, you can apply this idea of aquarium kitchen. The big aquarium is attached under the kitchen table so that it feels like the aquarium is the part of the table. The lighting from the aquarium makes the atmosphere in the area feels elegant. Combine this design with a dining table that its legs are made from the tree logs. Paint the dining table grey so that it matches perfectly with the kitchen table. Complete this idea with the wooden floor to make a natural style even stronger. 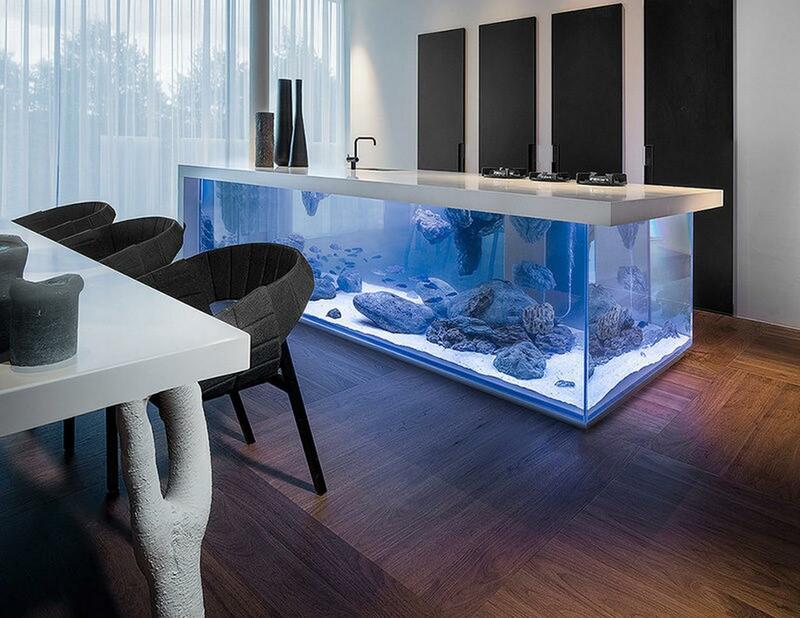 Another idea to feature a huge aquarium under the kitchen table. The space between the aquarium and kitchen table is able to give more spaces for the householders. 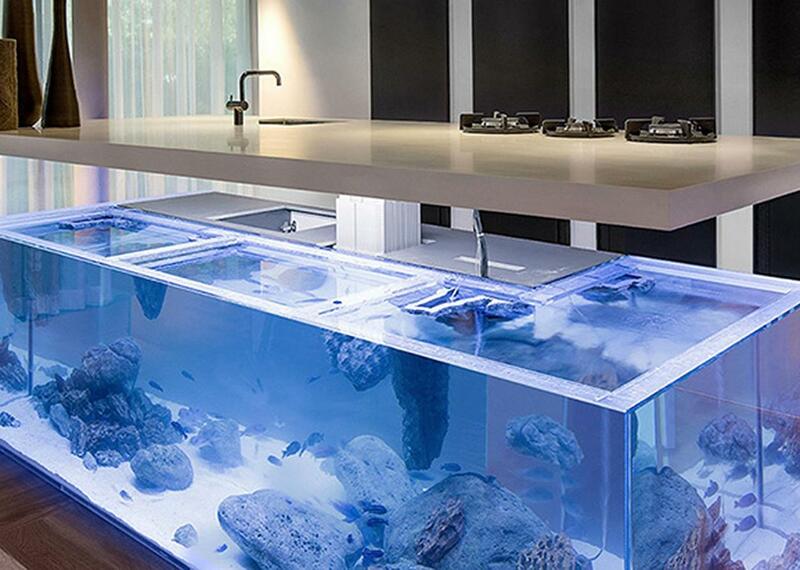 The sink above the big aquarium will make you feel like you wash the dishes above the sea. You are able to keep many species of decorative fish inside the aquarium in order to make it as a decoration in your kitchen. 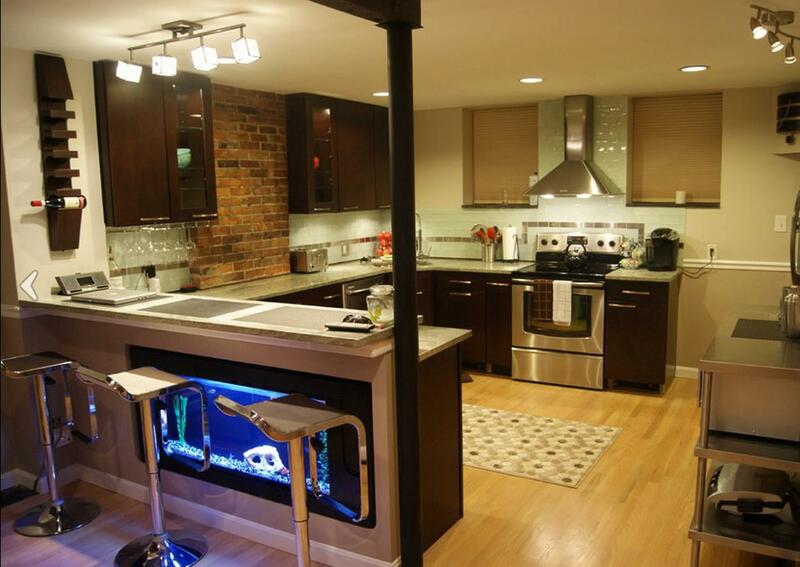 If you do not want a giant aquarium featured in your aquarium kitchen, you can follow this idea. A medium aquarium size is placed between the kitchen cabinets. This aquarium kitchen has a lot of cabinets so that the householders are able to have a bunch of storages to save their kitchen tools and dishes. As we look, there is just a little kitchen tools on the kitchen table, making it looks neat. The hidden lamps bring an elegant touch to the area. Moreover, the black with the stainless steel stripe background makes this kitchen looks a little bit modern. This aquarium kitchen has a classic country style. We can see it through the use of a classic hanging lamp and the colors used. The kitchen cabinets and dining chairs also have the classic country style. The combination colors of white from the kitchen cabinets, blue from the seats, and black from the kitchen table match perfectly. The wooden floors bring a warm and natural atmosphere to the area. 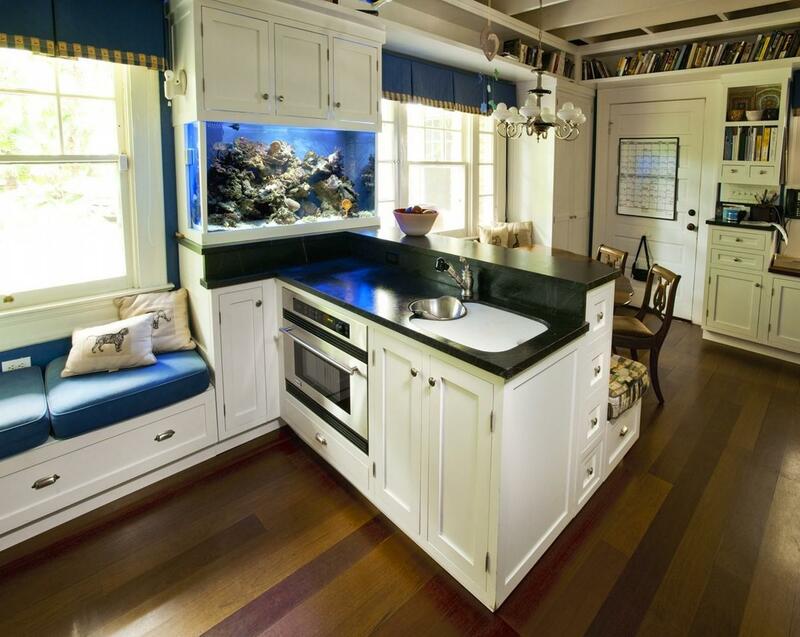 The aquarium is made as a decoration by placing it beside the kitchen area between the kitchen cabinets. This kitchen idea is very homey. 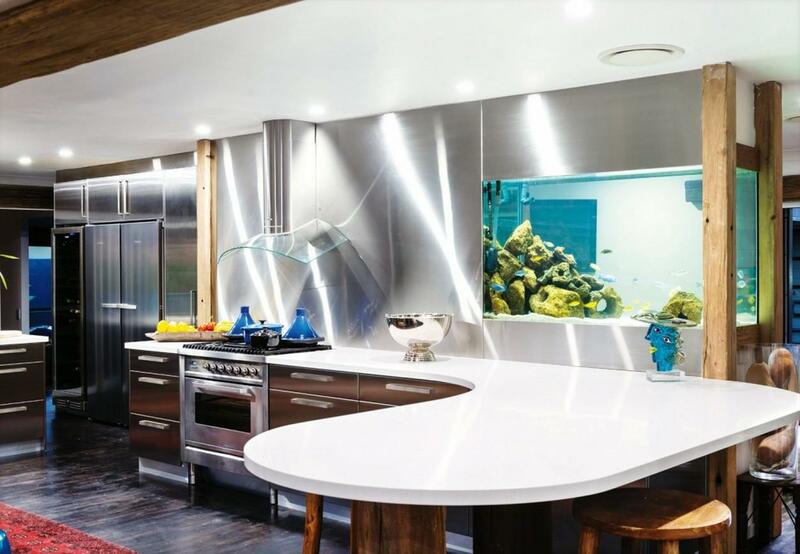 The white color dominates this aquarium kitchen. The marble material is used as the kitchen table because this material is strong and has a simple pattern, suitable for a simple and minimalist look. The long aquarium is placed between the built-in kitchen cabinets and kitchen table so that the householders can cook while enjoying the view from the aquarium. The built-in oven is able to save some spaces in this area. 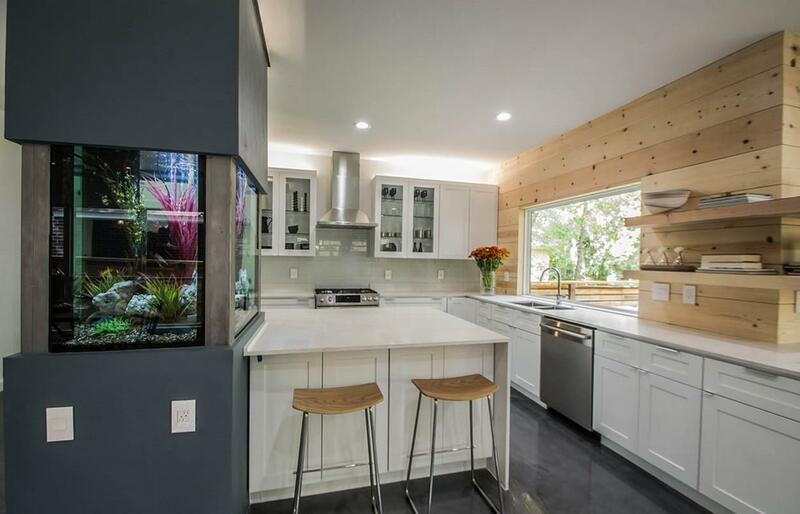 This aquarium kitchen idea is very modern. The medium-size aquarium is placed beside the kitchen area in order to make it as a decoration. The dining table is placed near the kitchen table so that the householders can easily prepare the meal. Usually, family portraits are put in the family room or living room, but the family portraits here are put in the kitchen, making it looks unique and homey. The use of wooden floor brings a uniquely different twist, but surprisingly, it still matches with the marble kitchen table. The combination colors of white from the kitchen table and kitchen cabinets, grey from the walls, and natural wood colors from the wooden kitchen cabinet match perfectly in this kitchen. The light natural wood colors make this kitchen looks so warm. It also has a lot of cabinets so that the householders can store the kitchen utensils, making the kitchen area clean. The window in front of the sink makes the kitchen looks more spacious. And it is surely relaxing to wash the dishes while enjoying the view from the outside. This aquarium kitchen is so warm because of the natural brown colors from the wood materials used. This kitchen is dominated by wood materials especially for the floors and kitchen cabinets. The addition of brick walls brings an industrial look to the area. Using the dim lights is a great idea because the kitchen is already bright from the light wood colors. Moreover, placing the wine cellar on the walls is very practical. 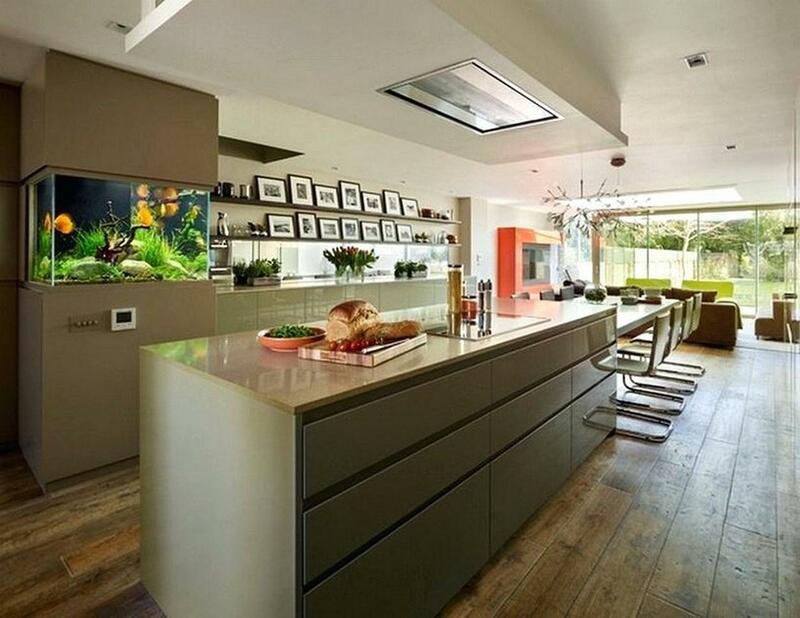 This aquarium kitchen is really modern and breathtaking. The medium-size aquarium is so clear and placing it in front of the kitchen area is a good idea. So that you can cook while enjoying the clear aquarium. The highlight lamps reflect the white table and clear aquarium, making the area looks so bright. The big stainless steel fridge brings a modern look to this kitchen idea. Moreover, the wooden dining chair matches perfectly with all elements used in this kitchen. The big clear aquarium is placed in front of the sink. A perfect idea to have an experience of washing dishes while enjoying the clear aquarium. The wooden material used for the kitchen table brings a warm atmosphere to this kitchen. It matches perfectly with the white kitchen cabinets where the householders are able to store the kitchen utensils there. So that the kitchen area looks clean and neat. 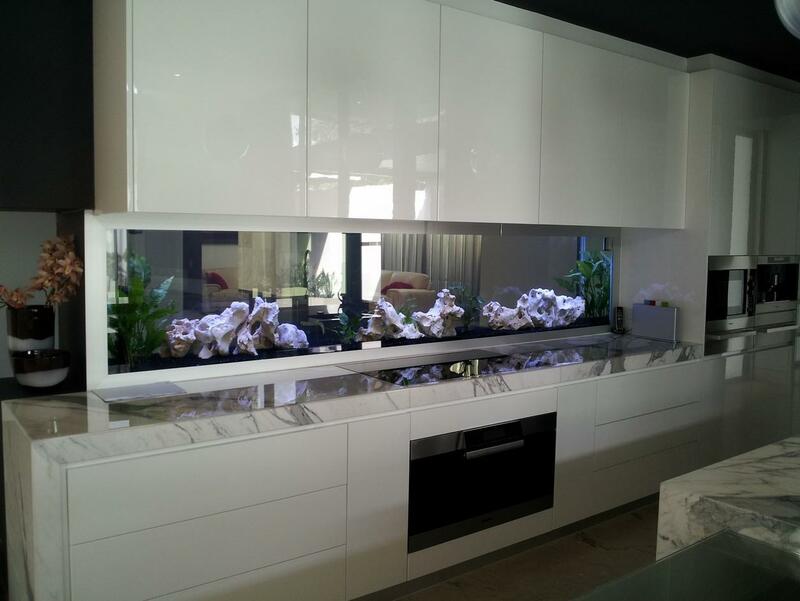 Those are the ideas of aquarium kitchen which can be your inspirations. Placing an aquarium in the kitchen is a smart idea to have a unique decoration for your kitchen. Especially if you are confused and looking for a perfect decoration for your kitchen. You can keep the decorative fish or other fishes so that you can directly catch from the aquarium and cook it.